Inspired By A Windy City Recipe, This “Chicago” Chicken Is Loaded With Flavor! Our family has been using this marinade for years, and we’ve come to the consensus that it’s just about the best way to make grilled chicken. Inspired by a dish we had when visiting Midwest relatives as kids, “Chicago” chicken is easy to whip up and packed with a ton of flavor! 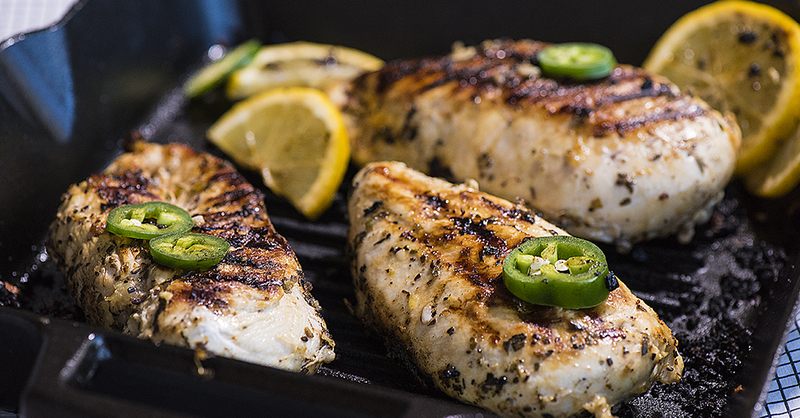 We prep the chicken (typically using white meat, but thighs and drumsticks are great too) in a tasty lemon and jalapeno marinade, then simply grill it up and dive in! Whatever you end up calling it, you can’t go wrong with this dish. In a large bowl, whisk together olive oil, lemon juice, garlic, oregano, jalapeno, salt, and pepper until fully combined. Add chicken to a gallon size zip-top bag and pour in marinade, making sure each piece of chicken is coated. Marinate in the refrigerator for 4-8 hours, or overnight. Heat a large skillet over medium-high heat (alternatively, you can grill at appx. 400ºF). Once heated, remove chicken from bag and add to skillet. Brown on one side for 6-7 minutes, then flip each piece and continue to brown until thoroughly cooked, approximately 6-7 additional minutes (time will vary depending on size of chicken). When internal temperature of chicken reaches 165ºF remove from pan, and let rest an additional 5 minutes.